Every program is designed to meet each student's needs and goals. Every student is assigned a one-on-one tutor. ​Every tutor is trained and mentored to provide the best ​learning outcomes for each student. 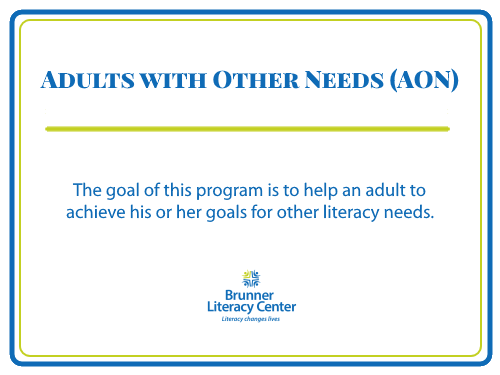 In June of 2012, sisters Mary and Martha came to the Brunner Literacy Center with a shared goal: to be able to read their mail. The sisters had grown up in a share-cropping family in Metter, Georgia, and as children they only attended school on rainy days because only then were they excused from working on the land. As a result, their education had never been a priority, and their reading skills were lacking. The women were in their early 70s when they came to the BLC, and they were frustrated with not being able to understand their mail. Typically students at the BLC work one-on-one with their tutors, but we made an exception for these sisters; they were matched with Nan, a retired primary school teacher who worked with Mary and Martha together. Martha remembers her mother’s advice: “She said, “Y’all stay together and make each other happy.’ And that’s what we did.” The sisters’ bond took them far. With Nan’s help, Mary and Martha met their goal in August 2012. The sisters had been receiving assistance through Meals on Wheels, and Meals on Wheels had sent notices to let their clients know that their service would not be available on Labor Day. Mary and Martha were thrilled to bring their notice into the BLC, triumphantly announcing to the staff that they knew they would not receive their meal that day. They didn’t care about the food. They cared that they had met their goal. The sisters continued to attend classes at the BLC, diligently taking the bus to Salem Plaza to continue working on their reading and writing skills. When Mary was diagnosed with cancer, she told her doctors that she would not go to any appointments that interfered with her tutoring sessions, and Mary upheld that promise. She attended the BLC until she moved to Hospice. In early 2015, Mary passed away. Now Martha gets a ride to the Center from her brother Roosevelt. She still attends tutoring sessions with Nan, and she has found a deep love of writing about her life. Martha writes stories about her childhood in Georgia, her life in Ohio, and her time at the Brunner Literacy Center. Says Nan, “I have learned a little bit of everything about harvesting Georgia crops!” Martha’s joy and passion for learning are an inspiration to all who know her.